The international conference “Vortices and coherent structures: from ocean to microfluids” was held at the Pacific Oceanological Institute of the Russian Academy of Sciences in Vladivostok (Russia) from August 28 to August 31, 2017. The event gathered experimentalists and theoreticians, oceanographers and physicists, with a common interest in observing and modelling fluid flows in different media, from the ocean to laboratory flows. It was a fruitful idea to bring together researchers from a variety of backgrounds to benefit from a vigorous discussion of concepts across different disciplines in oceanography and hydrodynamics. The present Topical Collection “Vortices, waves and coherent structures” contains 13 internationally peer-reviewed papers from participants of the conference providing an updated perspective on modelling a variety of vortex and wave motions, observation and simulation of transport and mixing processes in the ocean, observation and modelling of laboratory flows and novel tools for describing these processes. More details on these aspects are discussed in this preface. 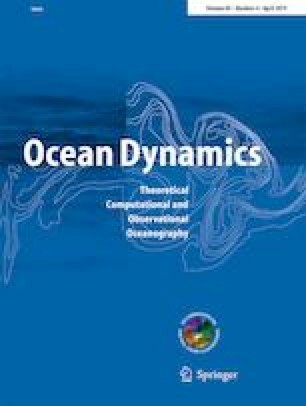 The serious hopes and prospects for further progress in understanding vortex and wave motions in geophysical, laboratory and model flows are essentially related to combined use of mathematical methods, computer simulation, laboratory experiments, satellite and in situ measurements. Such a multidisciplinary collaborations have led to interesting results that allow us to study the dynamical processes from new perspectives. The range of topics addressed by this conference is reflected in this Topical Collection, where the papers could be divided by their content in the two main themes. The first theme, discussed during the conference, is theoretical analyses of vortices and waves in model flows. The second theme is related to study of various dynamical processes in the real ocean. Riccardi (2018) proposes a new mathematical approach to kinematics and dynamics of planar uniform vortices in an incompressible inviscid fluid based on an integral relation between a Schwarz function of the vortex boundary and induced velocity. The vortex equilibrium configuration is found to depend on the behavior of the velocity on the boundary. In order to study the vortex dynamics, the definition of the Schwarz function is extended to a Lagrangian framework. This Lagrangian Schwarz function solves a nonlinear integro-differential Cauchy problem, that is transformed to a singular integral equation. Ryzhov and Koshel (2018) study a simple model of advection of fluid particles induced by interaction of a point vortex with a plane flow near a curved boundary mimicking the geometry of an isolated circular bay. Such a boundary induces appearance of the retention zones where the vortex can be permanently trapped being either stationary or periodically oscillating. A stationary vortex induces a steady velocity field and a regular advection. When the vortex oscillates periodically, the induced velocity field turns out to be unsteady leading to a manifestation of chaotic advection. The area with chaotic advection increases almost monotonically with the increased magnitude of the vortex oscillations if it is comparatively small. It is interesting that the bounded region with the trapped vortex can be at a significant distance from the bay. Sokolovskiy et al. (2018) discuss the formation of new quasi-stationary vortex patterns due to interaction of two identical vortices in a rotating fluid. Within the framework of the quasi-geostrophic approximation, the interaction of two identical initially circular vortex patches are studied using the contour dynamics/surgery method. The barotropic vortices and vortices in the upper layer of a two-layer fluid are considered in detail. Two such like-signed vortices evolve nonlinearly with filaments and vorticity fragments surrounding the merged vortex and often collapsing into satellite vortices. The authors find conditions for formation and quasi-steady motion of a new type of the triplet-shaped vortex structures. Kozitskiy (2018) studies nonlinear regimes in 3D double-diffusive convection using a set of complex Ginzburg-Landau type amplitude equations, valid in neighborhoods of Hopf bifurcation points. The equations were derived in previous works of the author using a spectral method. Numerical simulation of these equations clearly demonstrates development of spatiotemporal chaos in the system. The chaotic regime is realized in the form of non-stationary structures that depend on parameters of the system. Finite number of spectral components participates in formation of the structures whose shape does not depend on initial conditions. Churilov (2018) studies the linear stability of stratified shear flows for the case when the density profile is made up of one or more thin pycnoclines. This is governed in general by the Taylor-Goldstein equation and the issue is the difference between a stepwise density profile (the pycnocline is infinitely thin) and when it has a small but finite thickness. The stepwise approximation results in the appearance of two-sided neutral curves in the instability domain of the flow. The waves corresponding to the curves are neutrally stable whereas the neighboring waves on either side of the curve are unstable, in contrast with the classical result of Miles (1963) that in stratified flows unstable oscillations can be only on one side of the neutral curve. The author resolves the contradiction and analyzes the changes in the flow stability pattern under transition from a model stepwise to a continuous density profile. Basing on this analysis, a simple self-consistent method is proposed for studying the stability of sharply stratified shear flows with continuous density variations and arbitrary monotonic velocity profiles without inflection points. Kalashnik and Kurgansky (2018) study nonlinear dynamics of long-wave perturbations to the inviscid double-periodic in horizontal plane Kolmogorov flow. The Galerkin method with three basic spatially periodic modes is used to reduce the problem to three nonlinear equations for the mode amplitudes. Asymptotic analysis of this system shows the existence of linear, quasilinear and nonlinear stages of the perturbation dynamics. During the first two stages, perturbations grow with increasing time, and then the stage of stable nonlinear oscillations follows. The oscillations are described by the oscillator equation with a cubic nonlinearity, which is integrated in terms of elliptic functions. The authors obtain an analytical dependence of the period of the oscillations on the amplitude of the initial perturbation and describe the formation of a complicated time-periodic flow pattern consisting of closed vortex cells and meandering flows between them. An asymptotic analysis of nonlinear long-wave perturbations in the presence of small viscosity (very large, but finite Reynolds numbers) shows that all velocity components of the perturbed flow remain bounded in this case. Reznik (2018) extends his theory of wave boundary layers to a rotating stratified fluid where these layers arise in the field of near-inertial oscillations driven by a tangential wind stress of finite duration. The near-surface Ekman layer is specified in the most general form: tangential stresses are zero at the lower boundary of the Ekman layer and viscosity is neglected below the boundary. After the wind ceases, the Ekman pumping at the boundary becomes a linear superposition of inertial oscillations with coefficients depending on the horizontal coordinates. The solution under the Ekman layer is obtained in the form of expansions in the vertical wave modes. The author separates a part representing the near-inertial oscillations from the solution and demonstrates development of a wave boundary layer near the Ekman layer boundary. With increasing time t, the width of the wave boundary layer decays inversely proportional to the square root of t, whereas the gradients of the fields in the layer grow proportionally to the square root of t. The largest part of the near-inertial oscillations is concentrated in the wave boundary layer. The structure of that layer depends strongly on its horizontal scale L determined by the scale of the wind stress. The shorter is the near-inertial oscillations, the thinner and sharper is the wave boundary layer. The short-wave near-inertial oscillations with L smaller than the baroclinic Rossby scale LR does not penetrate deep into the ocean. On the contrary, for L > LR, the wave boundary layer has a smoother vertical structure. A significant long-wave near-inertial oscillation signal is able to reach the oceanic bottom. A few papers address the simulation of circulation and transport processes in the Far-Eastern marginal seas of the northwestern Pacific Ocean. Prants et al. (2018) simulate and analyze the southward near-surface transport of transformed subarctic water across the Subpolar Front in the Japan Sea based on altimeter data for a long period of time, from January 1, 1993 to December 31, 2017. Computing Lagrangian indicators for a large number of synthetic particles (for an introduction of this methodology, see the monograph by Prants et al. (2017b)), advected by the AVISO velocity field, they find preferred transport pathways across the Subpolar Front. One of the main and unexpected findings is that southward transport of transformed subarctic water occurs mainly in the central part of the frontal zone where there is no southward current. This transport occurs due to suitable dispositions of mesoscale eddies promoting propagation of subarctic water to the south. It is documented for the last 25 years with the help of Lagrangian maps of different indicators and verified by the tracks of available drifters. Some southward transport also occurs through the western and eastern transport corridors for the same reason. The transport of transformed subarctic water to the south is compared with the transport of transformed subtropical water to the north simulated by Prants et al. (2017a). Andreev et al. (2018) analyze circulation and transport in the Navarin Canyon area of the Bering Sea based on the altimetry-derived AVISO velocity field from 1993 to 2015. Large canyons incise the shelf-break of the eastern Bering Sea and are preferred sites of the cross-shelf exchange. The mesoscale eddy activity is shown to be particularly strong near the shelf-break canyons. To study the mesoscale dynamics in the Navarin Canyon area, the authors use time series of velocities derived from AVISO satellite altimetry between 1993 and 2015, drifters, Argo buoys and available shipborne data. It is shown that the strength of anticyclonic eddies along the shelf-edge in spring and summer is determined by the wind stress in March–April. The increased southward wind stress in the central Bering Sea forced a supply of low temperature and low salinity outer shelf water to the deep basin and formation of the anticyclonic mesoscale circulation seaward of the Navarin Canyon. Enhanced northwestward advection of the Bering Slope Current water leads to increase in an ice-free area in March and April and increased bottom layer temperature at the outer shelf. The strong (weak) northwestward advection of the eastern Bering Sea waters, determined by easterly winds in spring, creates favorable (unfavorable) conditions for the pollock abundance in the western Navarin Canyon area in summer. Stepanov DV (2018) performs simulation and analysis of the East-Sakhalin Current and of mesoscale eddies on the eastern Sakhalin shelf of the Okhotsk Sea in winter and spring based on an eddy-permitting numerical circulation model with the horizontal resolution of 3 km. Analysis of necessary conditions for the development of baroclinic instability shows that a nearshore component of the East-Sakhalin Current is potentially baroclinically unstable in the first half-year. The model simulation demonstrates a generation of anticyclonic eddies on the eastern Sakhalin shelf with the spatial scale of the first baroclinic Rossby radius of deformation. The lifetime of these eddies varies from 4 to 6 weeks, given the Rossby number varying from 0.05 to 0.2. Estimating the rate of the eddy energy conversion, it is found that these mesoscale eddies are generated, mainly, due to a baroclinic instability. The barotropic instability can be either favorable or unfavorable for the generation of these eddies. Demyshev and Dymova (2018) simulate the Black Sea circulation and energetics in two prognostic experiments with a real atmospheric forcing for 2006 and 2011 and a verification by observation data based on the eddy-resolving numerical model with the horizontal resolution of 1.6 km. The main dynamic features such as the Rim Current, the Sevastopol and Batumi anticyclones are reproduced in both the experiments. It is shown that both the vertical viscosity and vertical diffusion and an impact of wind are the main contributors to the annual and seasonal budgets of kinetic and potential energies of the Black Sea circulation. It is found that two regimes of the general circulation are implemented depending on the magnitude of wind contribution to the kinetic energy in winter. Intensive mesoscale eddies are generated along the Anatolian, Caucasian and Crimean coasts. The analysis of the Black Sea circulation and eddy energetics allowed one to conclude that generation and development of the mesoscale coastal eddies are associated with a barotropic instability in the case of intensive coastal currents and both with barotropic and baroclinic instabilities in the case of weak coastal currents. Zatsepin et al. (2019) discuss various mechanisms for the generation of submesoscale eddies in the Black Sea. Three main processes are identified and discussed: (i) a horizontal shear instability of the surface current, (ii) a flow separation behind capes and peninsulas and (iii) a spatial heterogeneity of the wind blowing from the coast to the sea. The various approaches used (field observations, remote sensing and laboratory studies) all converge well to support the analysis and understanding of the dynamical processes at work. Bashmachnikov et al. (2018) analyze the permanently existing anticyclonic Lofoten vortex in the Norwegian Sea based on the eddy-permitting hydrodynamic numerical circulation model MITgcm. This eddy is modelled as a columnar vortex with a helical structure. The model adequately reproduces the observed 3D thermohaline and dynamic structure of the vortex. The obtained radial distribution of the mean vertical velocity is found to form a complex structure: with the upward fluxes along the axis in and above the anticyclonically rotating vortex core, compensated by the downward fluxes in the vortex skirt. These vertical motions maintain the vortex potential energy anomaly against dissipation. This secondary circulation is generated by the centrifugal force and, to a lesser extent, by the horizontal dispersion of the vortex energy, both intensified towards the sea surface. Below the vortex core, the maximum downward vertical velocity converges towards the vortex axis with depth. At these depth levels, the secondary circulation is forced by the Ekman divergence in the bottom mixed layer. The theory of columnar vortices with a helical structure relate the radial profiles of the vertical velocity with those of the horizontal circulation. The theoretically predicted radial patterns of the mean vertical velocity in the Lofoten vortex are close to those, obtained from the primitive equation ocean model, when approximating the radial patterns of the azimuthal velocity with the Rayleigh profile. We are pleased to invite everyone who is interested in attending the next conference in Vladivostok on these topics to follow the announcement at the site http://dynalab.poi.dvo.ru. The publication of this Topical Collection would be impossible without an international team of reviewers, to whom we would like to express sincere thanks to all their generous efforts to ensure the quality of the papers. All people who helped in the planning and organizing the meeting are thanked for their efforts. We also thank Professor Jörg-Olaf Wolff, Chief Editor, for his interest in this event and his valuable advice during the preparation of this collection. The meeting was supported by the POI FEBRAS Program “Mathematical simulation and analysis of dynamical processes in the ocean” (No. 117030110034-7).